I don't know how to read Hebrew or Greek. Okay, that wasn't too much of a secret. But it suprises me how many people assume that I must be able to. So let me tell you my real secret. I use the Strong's Concordance... a lot. Strong's Concordance was first published 1890 and is basically an index to the Bible. It allows readers to find the original Hebrew or Greek words that are used in the Bible and to compare how the same word is used in other places in the Bible. It isn't a translation of the Bible but is meant to be used by people who don't read Hebrew or Greek (like me) in order to help them gain a more accurate understanding of the Bible. Strong's Concordance was originally printed in book form and you can still buy and use it that way. They also have concordances that are online and which I have found are much faster and easier to use. Today I am going to show you how to use an online concordance, but just know that the process isn't much different if you are using the print version--- just more page flipping. My favorite concordance is one I found at Bible Study Tools. I have the website saved to my Ipad and when I study my scriptures I often pull up the website to check the original meaning of words that seem confusing or out of place to me. Unfortunately the website doesn't work the same on my Iphone, and I haven't found another concordance that I like to use as much. If I find a good Iphone one (or if anyone knows of one) I will be sure to share it. So to start off let me show you the process I went through when I was studying the story of Naomi (written here). 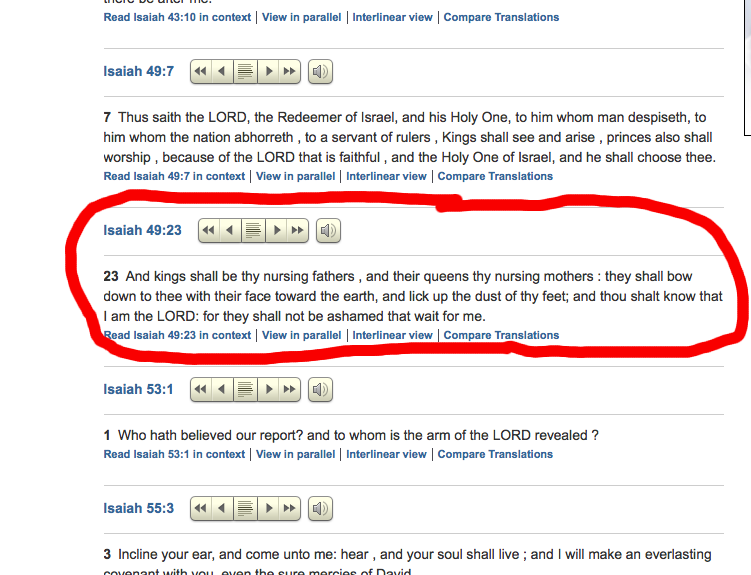 I was intrigued by the word "nurse" that was used to describe her role to her grandson and so I looked it up in the concordance to see what the original word was. 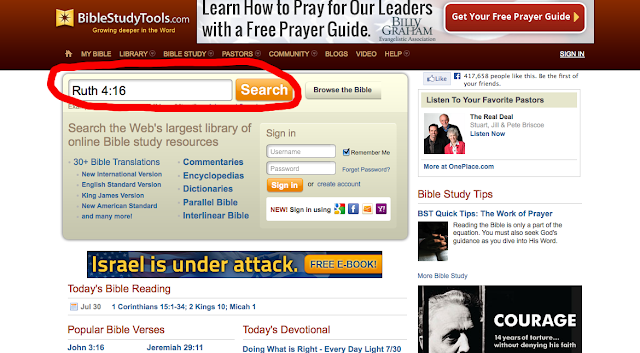 The first step is to go to the home page for Bible Study Tools and type in the verse of scripture the word you want to study is in. It works best if you just put in one scripture at a time and not a group of scriptures. After your search it will pull the scripture up like this. This website will pull up many different translations so make sure that the translation you want to use is pulled up by selecting the box on the right side. On my computer the King James Version is the default translation and, since that is the one I use, I don't usually have to worry about this. But if you are reading a different translation you will want to make sure it is selected. To turn on the concordance click the box on the right hand side that says "Strong's Numbers". After you have selected that box then it should hyperlink all the words in the verse that have a concordance reference to them. In this case I was interested in the word "nurse" and so I clicked on it. 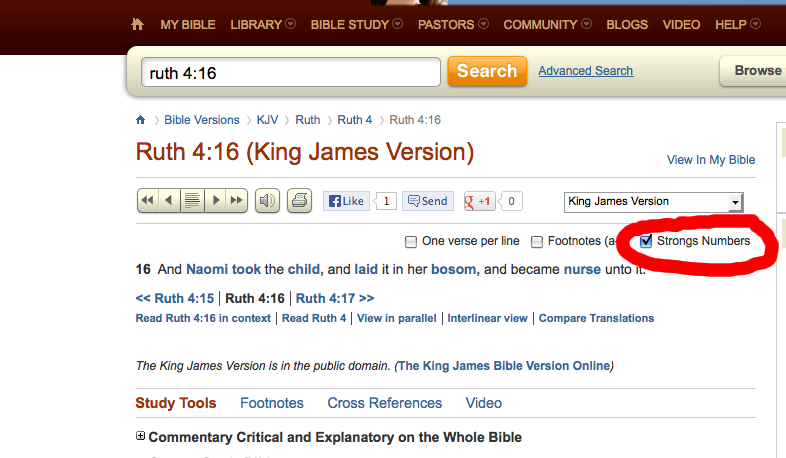 It will then pull up the concordance reference for the word that is translated in the KJV as "nurse". In this case the word that is translated as "nurse" is actually the Hebrew word " 'aman". The concordance will give you the original Hebrew word if it is an Old Testament reference or the original Greek word if it is a New Testament reference (you may need to download the fonts on your computer to see them). It will also give you the transliterated word, so that you know how to say it. It will also give all possible definitions of the word, with the first definition being the most common and the last one being the most obscure. I think the most helpful part of the concordance for me is the bottom section where it tells you how often the word is used, how else it is translated, and how many times that translation is found in the Bible. It is amazing how one Hebrew or Greek word can be translated into SO many different English words. For example, "aman" is translated as "believe, assurance, faithful, sure, established, trust, verified, steadfast, continuance, father, bring up, nurse, be nursed, surely be, stand fast, fail and trusty." 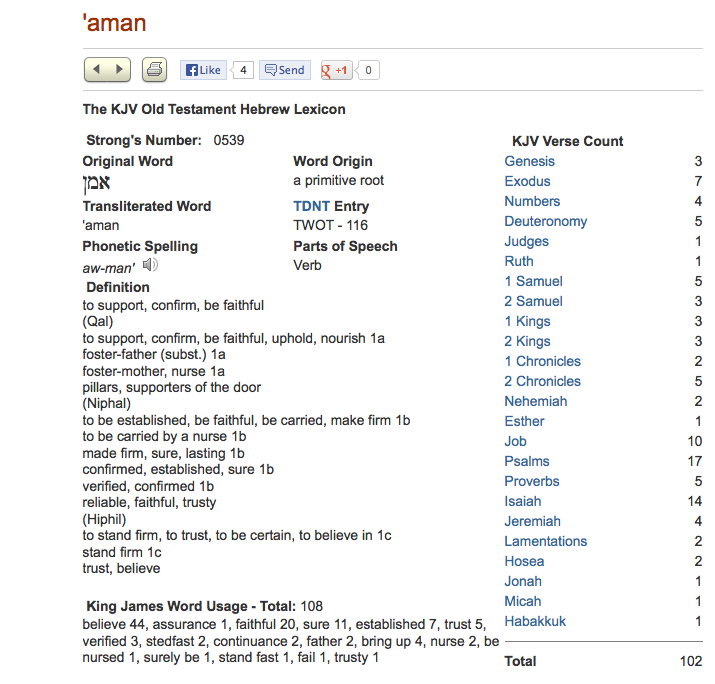 In addition the column on the right hand side gives scripture references to all the different places that the word "aman" is used. Whenever I am studying a word I make sure to read through several of the cross-references so that I understand how the word was used in other contexts. One of the biggest downsides of the concordance is that it doesn't take into consideration things like historical context, figures of speech, metaphors, idioms, or cultural references. Those are things you really need training in ancient civilizations and languages to understand, and is one reason that one word can be translated into so many different English words. Still, by reading all the scriptures in which the word was used it can still teach you a lot about what the original meaning of the word was and how it was used by the people of that time. 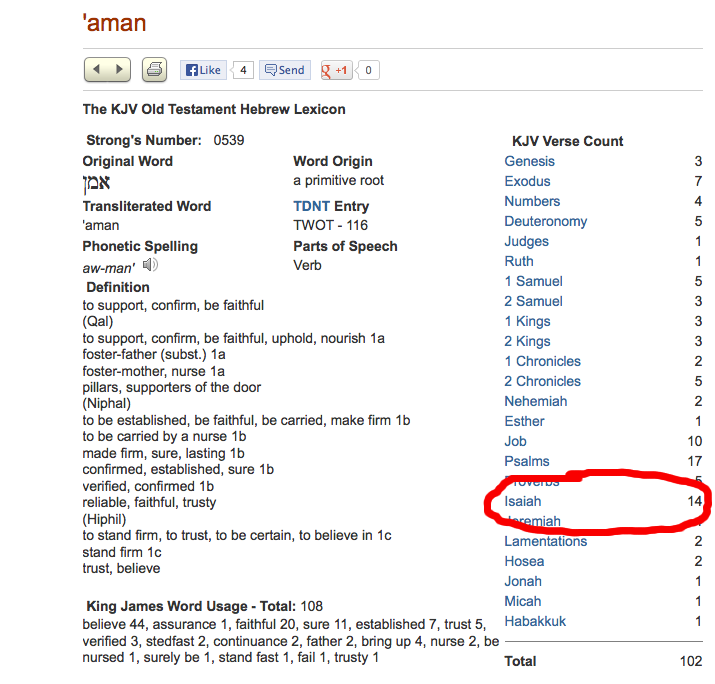 For example lets look at the references to "aman" in Isaiah by clicking it on the right hand column. It will then pull up all the times "aman" is used in the book of Isaiah. You will notice that most of the references don't translate the word as "nurse" and so sometimes you might have to go back and look at the alternate translations to figure out which word is the one you are looking for. 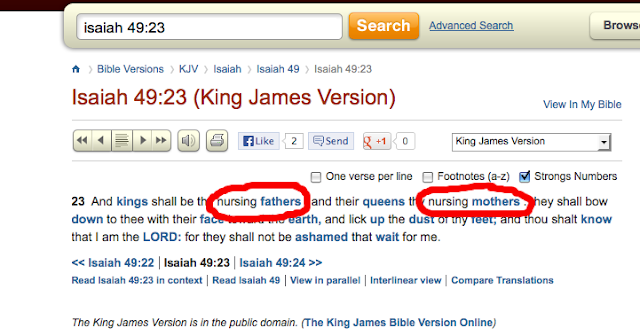 The Isaiah scriptures were very interesting to me because I was surprised to find that the scripture about "nursing fathers" and "nursing mothers" came up. This intrigued me and so I wanted to keep going a little deeper. I typed Isaiah 49:23 in as it's own reference (back to step number one) and did a concordance search on it (just like I did before). You will notice that the word "nursing" here is not highlighted with a concordance link. Whenever you see significant words (not just filler ones) that don't link up it usually means that the words before or after them encompass their meaning. When I selected "fathers" it pulled up the page on the word "aman" and so I could conclude that in this case the whole phrase "nursing father" was what was being translated. I could also conclude that the same word, "aman", that was used by Isaiah to describe "nursing fathers" was also the same word used to describe Naomi's "nursing" relationship to her grandson. But it is even cooler because when I selected "nursing mothers" I was expecting it to also pull up the word "aman", but it didn't. 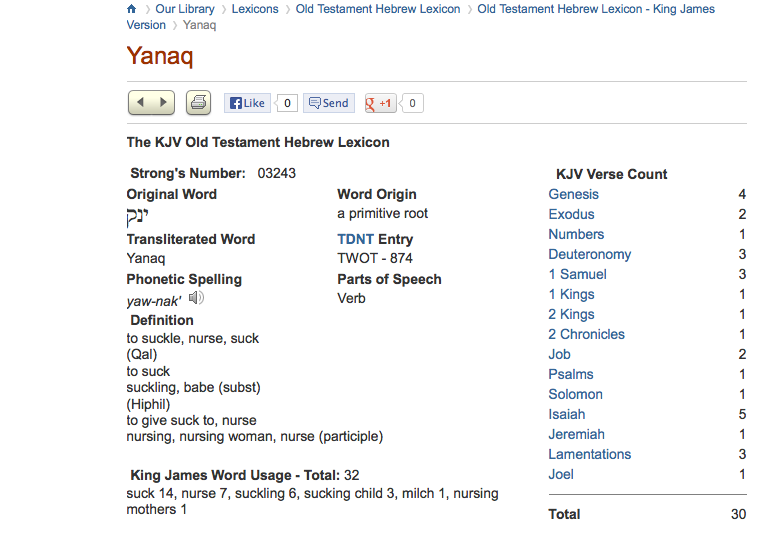 The original Hebrew word used here is "yanaq" which as you can see below has a much different meaning. This was really exciting for me to discover because the English translation makes it sound like "nursing fathers" and "nursing mothers" are doing the same sort of work. Yet when you read the original words in Hebrew it makes it very clear that there are two different sort of responsibilities for the Kings and Queens that Isaiah is speaking about, but that they both have "nursing" components to them. For me it completely changed the way I understood that scripture and opened up a whole new train of thought. This is one of the reasons why some day I would LOVE to learn Hebrew and Greek. It would make reading the scriptures so much more enlightening and exciting, because so much of the meaning of the scriptures can get lost in translation. Yet, in the meantime the concordance is the best tool I have, and I use it a lot. Whenever I read a scripture that confuses me usually the first thing I do is pull it up in the concordance and start looking up the original meanings of words. Even when it appears that the meaning of the word if obvious I sometimes pull it up anyway, just to check. I could do dozens and dozens of posts like the one I have shown today, where words that I thought I knew the meaning to ended up having a much deeper and significant meaning. It is really exciting and it makes scripture study a bit addictive! I hope that this post was helpful and that it gets you excited to dig deeper into your scriptures. One word of advice. Make sure you always write down (in your scripture journal or other special place) what you learn after doing a concordance search. There is nothing more frustrating than getting an amazing insight and the next day not being able to remember what words you had been studying. Wow. I didn't know this existed. That is really, really interesting about nursing mothers & fathers. I can't wait to tell my husband! :). Thank you so much for sharing, I will definitely be using it. Wow! My husband has an old copy of Strong's Concordance, I think it belonged to his parents. It has been at the top of the bookshelf for 20 years and I don't think I've done more than dust it. It comes down today. Tho' I imagine the online will be much more convenient. Never even new this existed. Thanks for sharing. how COOL!!!! Thanks for sharing! What a wealth of knowledge.